Short in length, big in performance. 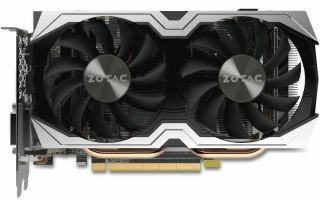 Zotac just added a smaller version of the GeForce GTX 1070 to its graphics card lineup. It measures just 210mm (under 8.3 inches) and is intended for system builders who are trying to squeeze copious power inside a small form factor chassis, including those featuring ultra-small mini-ITX motherboards. The GeForce GTX 1070 Mini (ZT-P10700G-10M) is not quite as compact as Zotac's miniaturized GeForce GTX 1060 (ZT-P10600A-10L), which measures 174mm (around 6.9 inches), but it certainly takes up less space than Zotac's regular sized GeForce GTX 1070 (ZT-P10700I-10P), a card that spans 303mm (~12 inches). Interestingly the GeForce GTX 1070 Mini is clocked slightly faster than its bigger brother. From the factory, it has 1,518MHz base and 1,708MHz boost clock, versus base and boost clocks of 1,506Mhz and 1,683MHz, respectively, on the longer card. Of course, neither one is clocked as high as the Amp (1,607MHz/1,797MHz) and Amp Extreme (1,632MHz/1,835MHz) models. The only other difference with the Mini versus the standard edition card is that the shorter part features two cooling fans instead of three. Otherwise, the specs are the same—both require a single 8-pin PCIe power connector, both take up two slots, and both have three DisplayPort 1.4 outputs, a single HDMI 2.0b output, and a DL-DVI output. There is no mention of the MSRP, though we spotted the GeForce GTX 1070 Mini on Amazon and Newegg for $395. Jet also has it for that price, or as low as $385 if you opt out of free returns and pay by debit card.